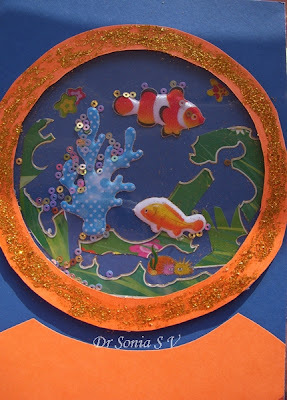 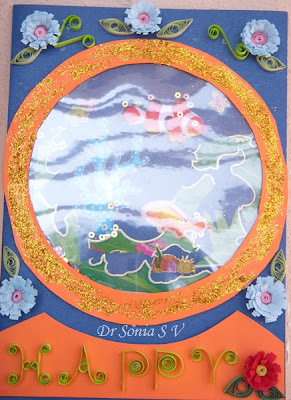 There is an exhibition going on in my daughters school and we have been working on it for over a week now.There was a selection of themes such as life under ocean, electronic gadget, insects,national symbols, my daughter chose monuments of India. So we decided to do the Taj Mahal. 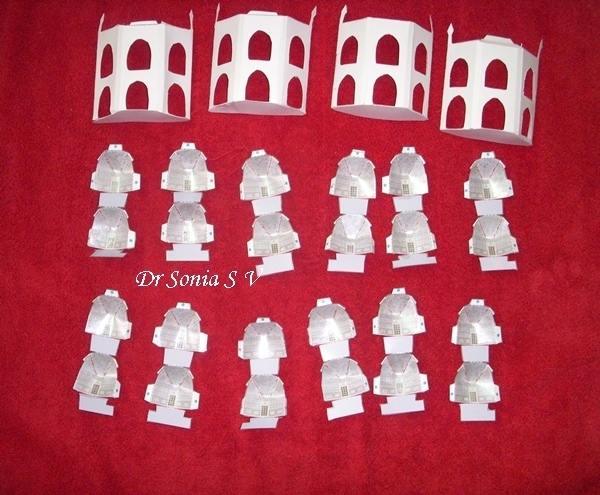 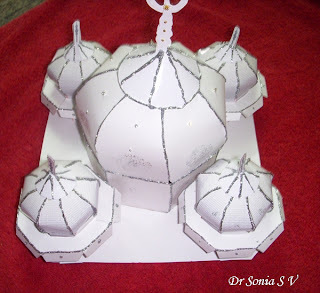 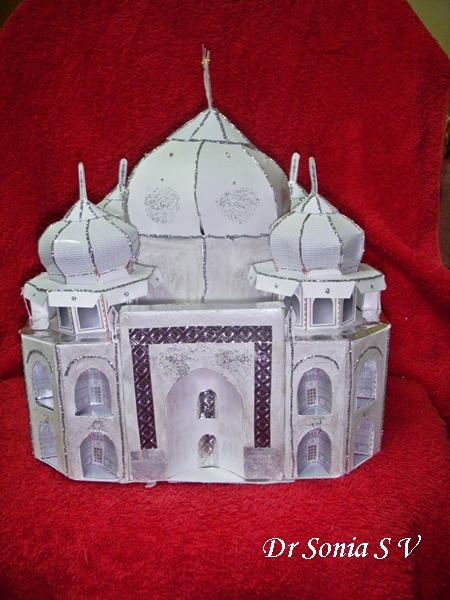 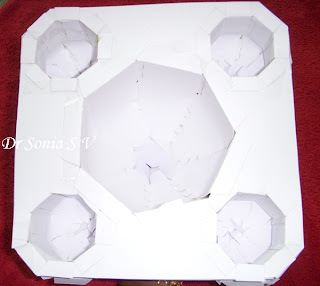 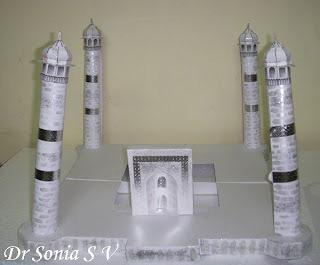 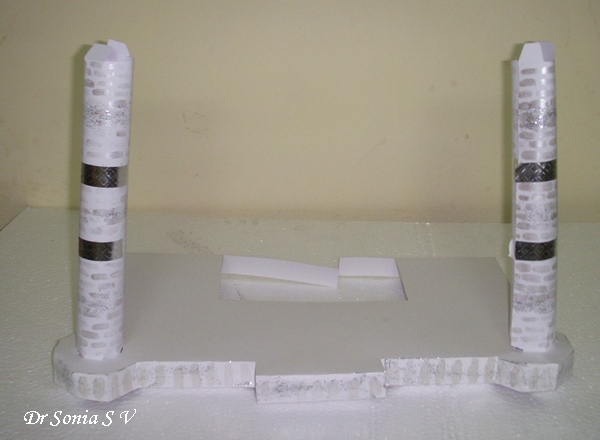 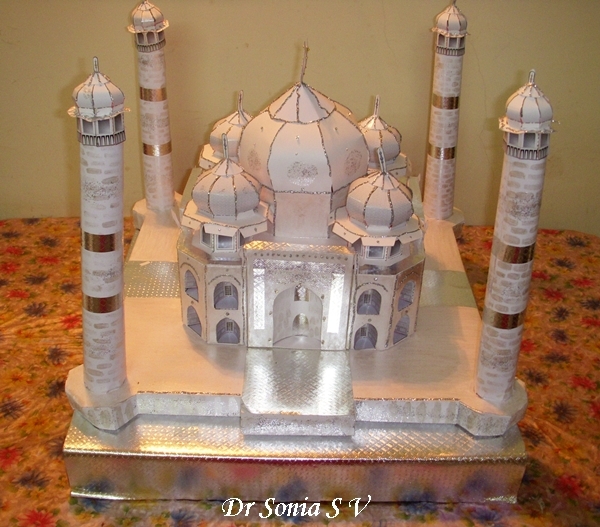 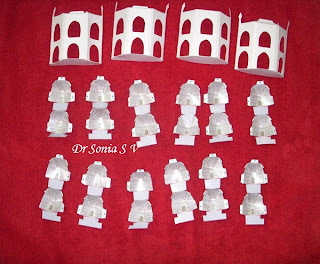 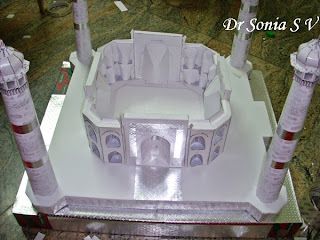 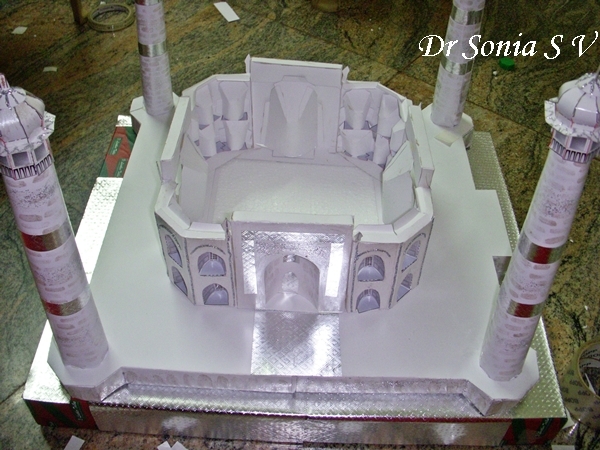 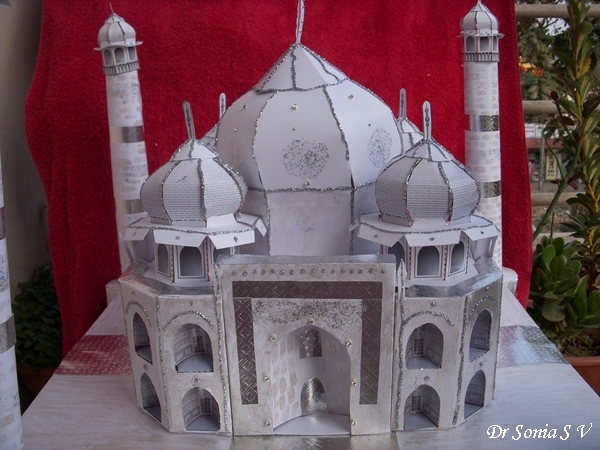 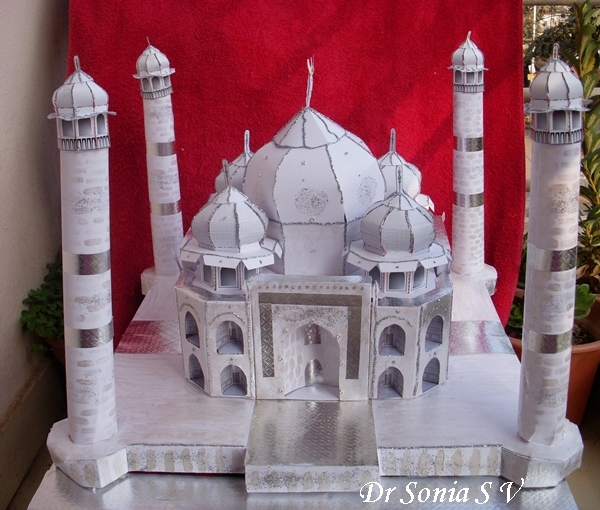 We made a Taj Mahal Paper Model.Here is the link to our Taj Mahal Paper model. 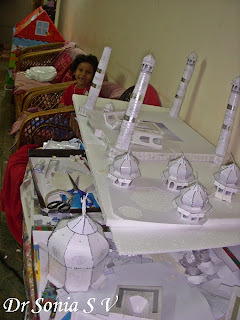 Making the paper model of the Taj was so time consuming and Just to get my 4 year old interested in the Taj Mahal I printed a Taj from the net and gave it to her to colour. She did it so well that I decided to frame it and sent it on the actual school exhibition along with the Taj Model we made. 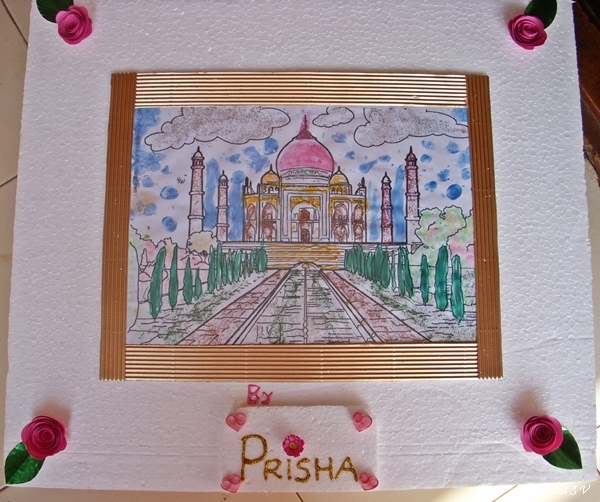 She helped frame the Taj Mahal Painting and also to decorate it with the spiral roses. 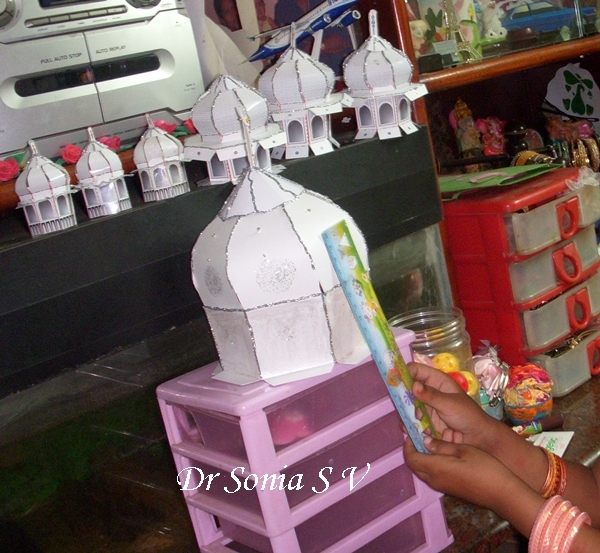 She was so proud of it! 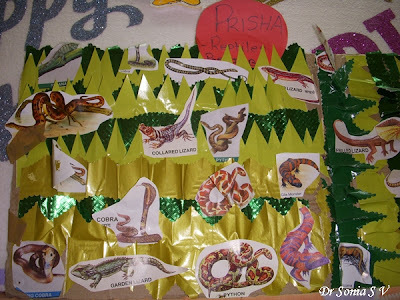 This Reptiles chart was done nearly completely by my little one. 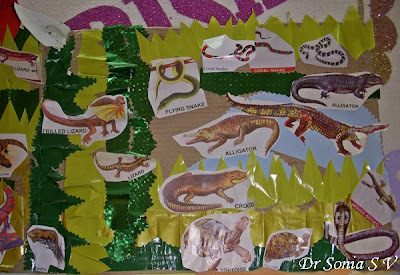 She even cut out the green background with the serrated scissors.She decided which reptile would go in the water which one would be on land and I must say she had a gala time! 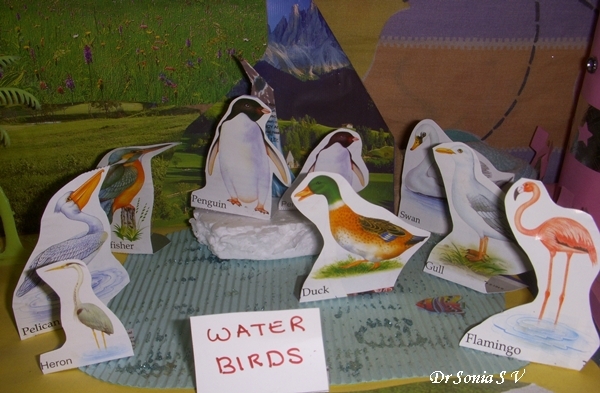 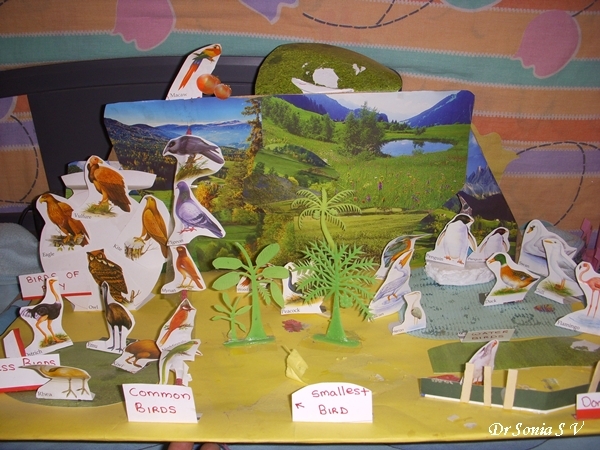 This is a Birds Diorama project we did for my daughter's theme on Birds. 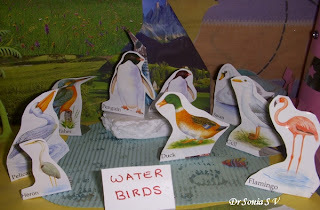 Some of the birds we attached to a rope running through the center of the diorama. 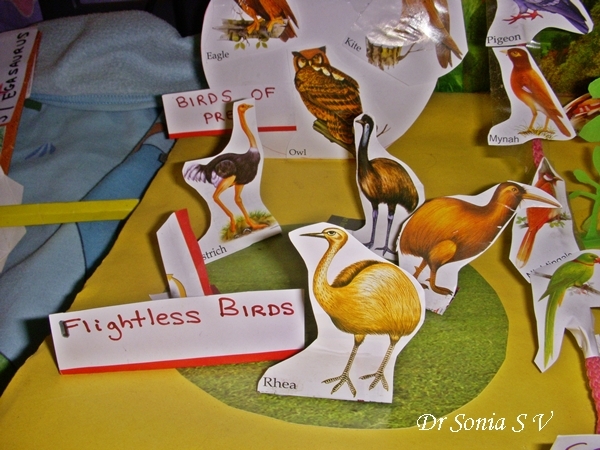 The different Categories of Birds flightless birds, water birds, birds of prey and water birds have their own small area. 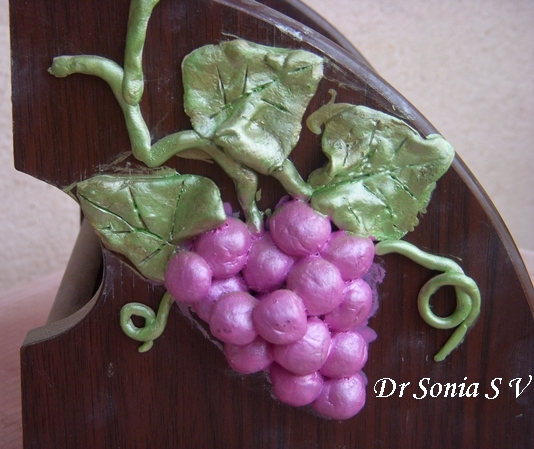 Mseal Grapes are easy for little fingers to shape . 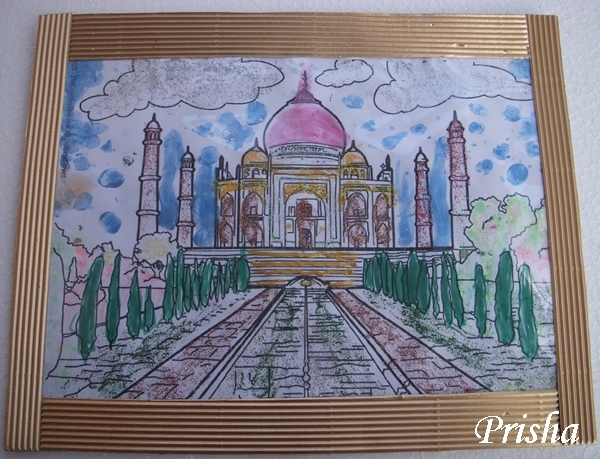 My daughter was fully involved in this one . 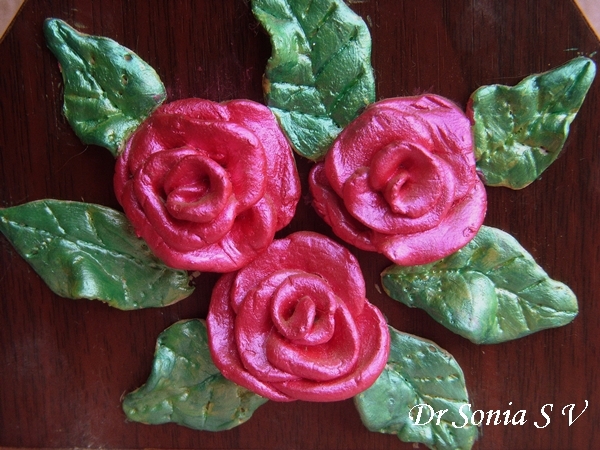 The grapes are really easy to stack on each other and coloring is also a breeze! Aren't those grapes good enough to eat! Mseal Flowers Roses. 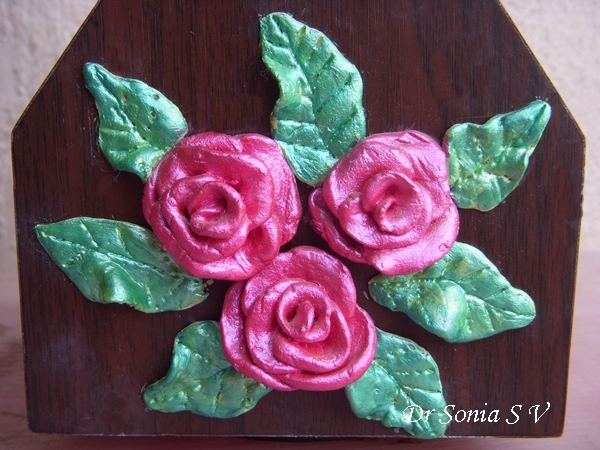 My daughter loved to paint the bright pink roses! 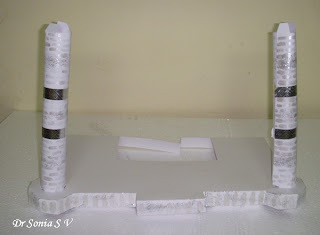 Mseal was a little tough for my little one to mix and shape but she enjoyed painting the strawberries to decorate our pen-stand. 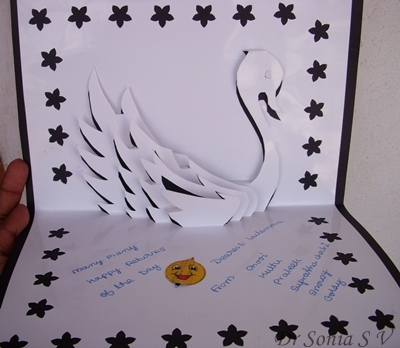 This Pop up card made using a Kirigami Design from Marivi was a tough one! 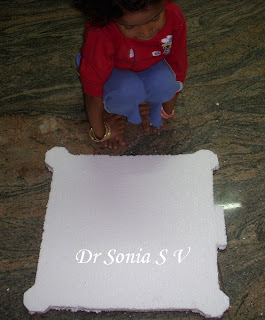 Salt Dough made out of white flour and salt is a good medium for kids to work. 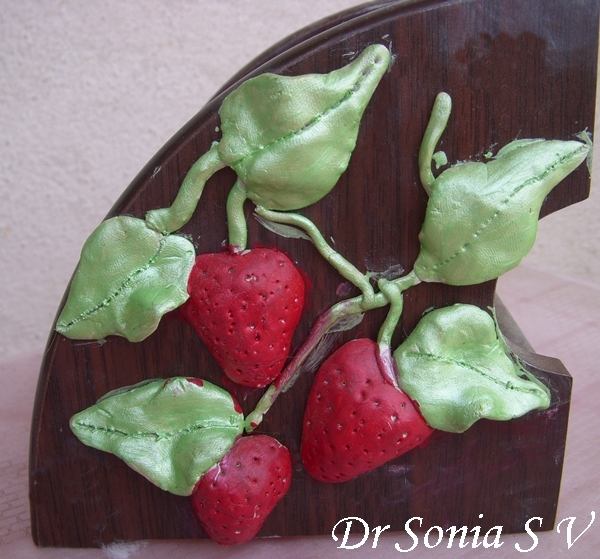 This salt dough fruit basket was made with a good amount of contribution from my 4 year old.She even had a go at painting the fruits.We shaped the dough, baked it and then colored it.We had incorporated a hook from a old key chain so that we could hang it up. The template for this magical Pop up card is from canon.Canon pop ups are easy to make and 90% of the time turn out well. 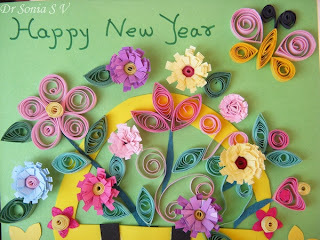 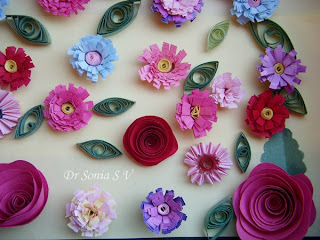 Quilling is my new Passion. It is relaxing and rewarding.Here are fringed flowers, Accordion Folded flowers, Spiral Rose flowers and hand cut leaves and rolled leaves. This is a Card I designed myself. 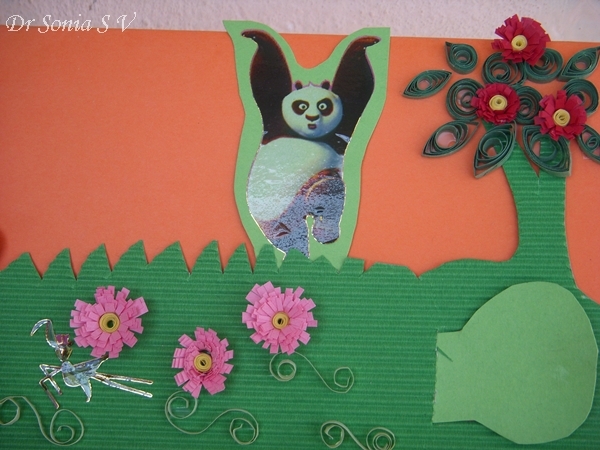 My daughter is a big fan of Kungfu panda .On pulling the green Lever the Panda jumps and jiggles this is by means of a right angle lever mechanism using a hidden metallic brad mechanism at the junction of the panda piece and the Horizontal piece. 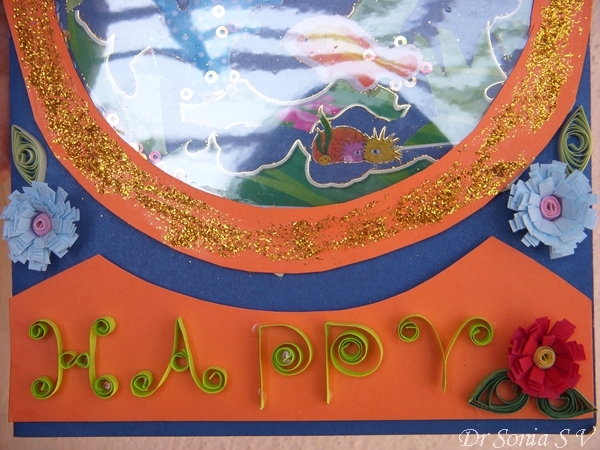 I loved making the quilled embellishments for this card. I redid my first quilled card! 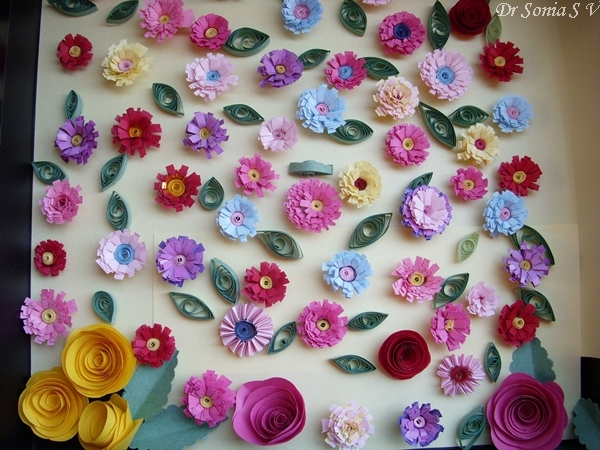 I added a couple more flowers and Leaves. 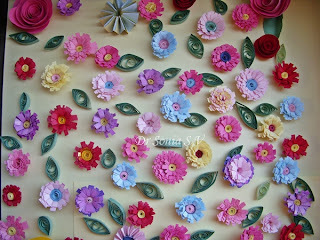 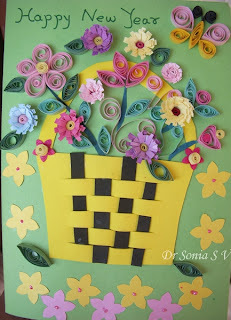 Quilling is addictive! This is a shaker card made with stickers and sequins.Children especially love shaker cards . It is fascinating to see the sequins and glitter change the scene.I use double sided adhesive tape to make the shaker cards. Making a circle shaped shaker card is more of a challenge than a square or rectangle!Later I used quilled flowers to embellish this shaker card a bit. The quilled Letters were easier than I thought! 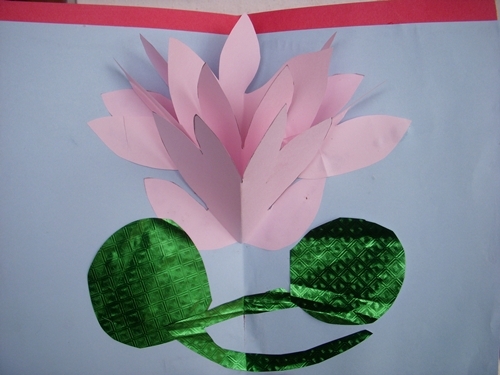 This lotus was made by my daughter. 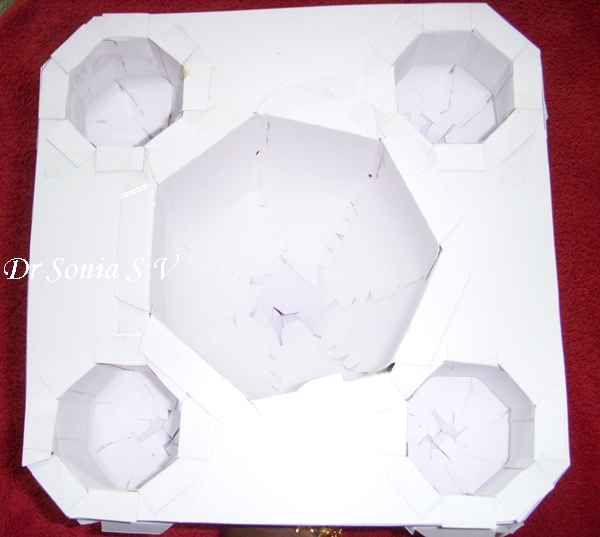 She helped to even cut out the pieces. 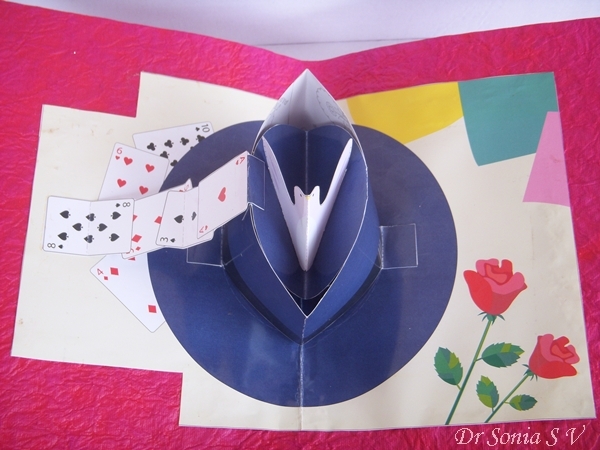 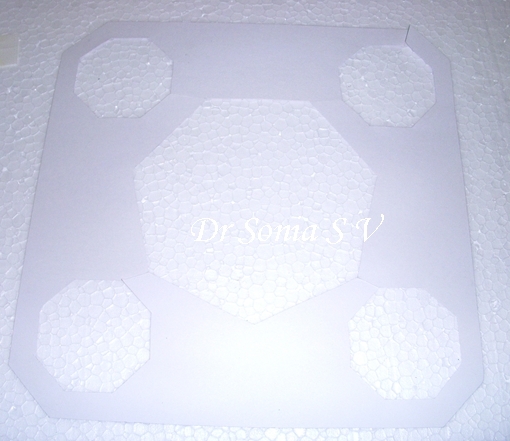 Its a Robert Sabuda pop card and even though it looks complicated its quite simple to make with children. 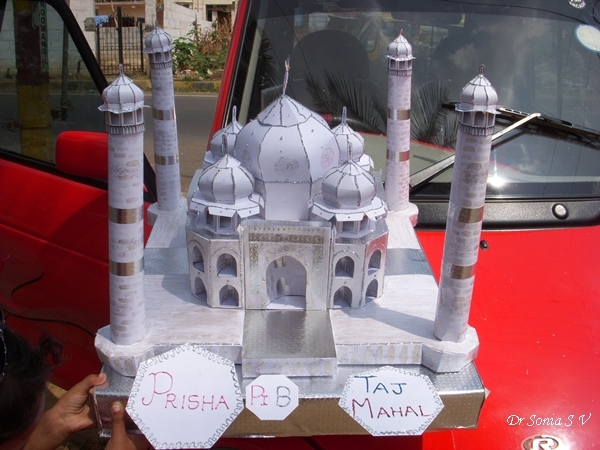 We made this for the national symbols school project. 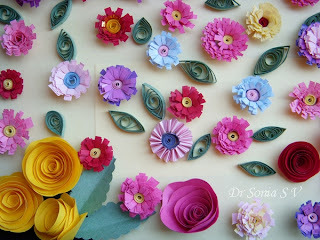 Lotus is India's national flower. 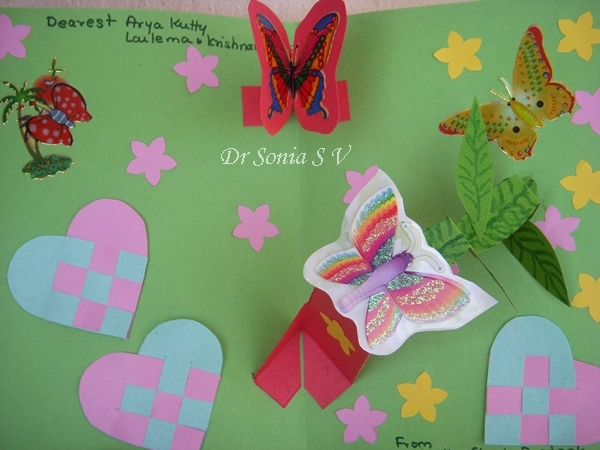 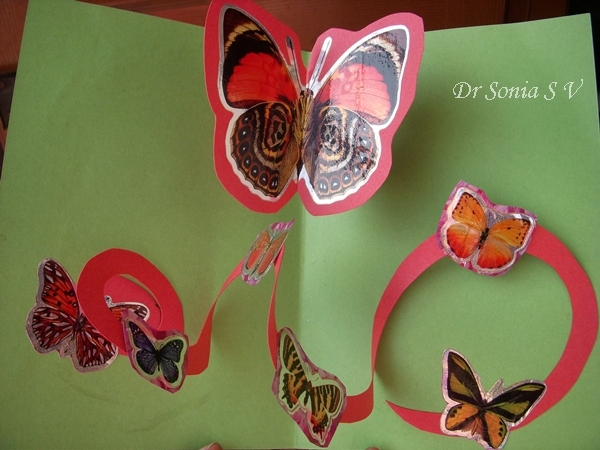 This is a favorite spiral pop up card plus Butterfly Pop up card. The spiral card is easy to make the Pop u Butterfly raises high up on opening the card- that was the trickier part.The spiral pp up card is easy to make and you can check out the spiral pop up card tutorial.